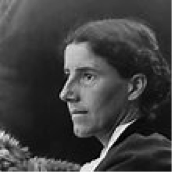 As one of the first feminists in America Charlotte Perkins Gilman spent her life promoting the right of women to be more than just housewives subjugated to the whims and dominance of their husbands. She was also a poet, novelist and social reform lecturer. Gilman’s father redeemed himself as Charlotte grew up. He encouraged her love of reading and later paid for her to enroll in classes at the Rhode Island School of Design. She expanded her interest in art at this time and encouraged others in this. Following her education she embarked on a varied career which included a short spell as a door to door saleswoman. She became heavily involved in social reform and the suffrage movement whilst living in Pasadena. Inspired by her passion for social change she had begun writing and in 1890 she published a poem called Similar Cases which satirised those who resisted social change. In that same year she wrote prolifically and her output included her most well-known short story titled The Yellow Wallpaper, published in 1892. This was written following a bout of post-partum psychosis and depression after the birth of her only daughter Katharine in protest at the enforced bed-rest prescribed for her by a male doctor and what she saw as the oppression of women by men. Gilman divorced her first husband – a rare event in those times – in 1894 and married again in 1900. Following the sudden death of her second husband in 1934 Charlotte returned to Pasadena.